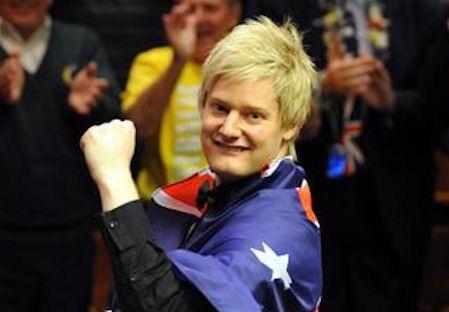 Australia's Neil Robertson captured the 2010 Betfred.com World Snooker Championship. In the final he defeated Scotland's 2006 world champion Graeme Dott 18-13. The English pair of Allister Carter and Mark Selby lost out in the semifinals. Robertson received £250,000 for the victory and Dott got £125,000 for his runner-up spot. Mark Allen (N.Ireland) and Dott shared the £10,000 high break bonus after compiling the first breaks of 146 in world championship history. In total there were only 59 centuries in this year's event. Defending champion, scandal-stricken John Higgins (Scotland) surprisingly lost 13-11 to living legend Steve Davis in the second round. This was the 30th world championship appearance for Davis. The last player to successfully defend his world title was Stephen Hendry (Scotland) in 1996. This was the first world title for Robertson. His previous best was last year when he reached the semifinals. It was his second ranking title of the season and fifth of his career. He has yet to lose a ranking final. He was the first Australian to lift the world trophy since Horace Lindrum in 1952. Many don't consider Lindrum's win to be legitimate though. With this win Robertson improves from ninth to a career-best second in the official rankings. Dott climbs from 28th to 13th. Higgins moves from fourth to first and Ronnie O'Sullivan drops from first to third. Peter Ebdon and Joe Perry drop out of the top 16. Liang Wenbo (China) is the only first-timer in the exclusive group. The event took place Apr 17 - May 3, 2010 at the Crucible Theatre, Sheffield, England. It was the last of six ranking tournaments on the 2009/2010 Main Tour.